It was February 1993 and the eight year old me is boiling over with excitement. Why, because I'm headed to see Army of Darkness at the movie theater. I had never had the chance to see Evil Dead 1 or 2 in the theater because of my age, but tonight, well, afternoon matinee, that would all change. Coming out of the theater after Army of Darkness ended I couldn't stop talking about how awesome it was. When that ending hit, I knew there would more. The way it ended clearly left off for another sequel, so all I had to do is wait... But little did I know how long I'd have to wait. As the months rolled by I spent my time buying up the AOD comic books from Dark Horse and then the figures from McFarlane's Movie Maniacs. After a few years past it seemed that I was no closer to another Evil Dead. But then a great thing happened, the internet, and I could read about rumors in real time about the next installment. And that is what I did with majority of my 90's, reading rumors about Evil Dead 4 (and Freddy vs Jason). Then I gave up, but kept an ember of hope burning that one day I would get my 4th film. That feeling of boiling over excitement is something that is harder and harder to get the more you age. When you are a child everything is exciting because it's new and your experiencing it for the first time. But as you age you become less enchanted with things because you have experienced it before. Add to the fact that after 1995 you could get, almost, anything at the push of a button and now I became a part of the instant gratification generation. That "want it, got it" mentality stayed with me for years and when rumors of Evil Dead 4 would bubble up I started to resent the franchise. How could they string along not just me, but tons of fans for years and never deliver. This resentment sat with me for years, but as you learn of the hurdles that have to be jumped to get a film or show made you begin to understand that somethings just may never happen. You may not like it, but you understand it. Yet that all changed when news of the series broke. I instantly jumped back on the " Evil Dead 4 is a go" wagon. Granted I had my reservations, but this was it. It was finally happening. Now cut from eight year old me in 1993 to thirty year old me in 2015, only this time around I'm not alone and I have my own eight year old son who, you guessed it, loves Evil Dead also. That excitement that I talked about is back and this time it's more so because I now have my own son to share this excitement with. You see, that wait wasn't a punishment it was just a wait. I had gotten so use to getting everything when I wanted it that I had forgotten that joy of seeing something that actually required patience. 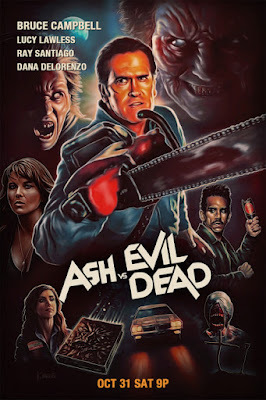 That excitement that I hadn't had since being a kid was back and it felt great.So as I sat there on Halloween night with my eight year old son and seeing the excitement on his face that I felt inside I knew that Ash vs Evil Dead was well worth the wait. 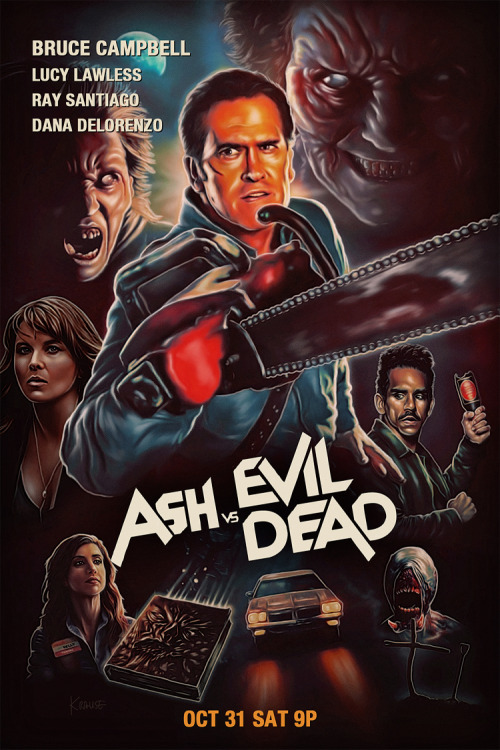 On a side note: Ash vs Evil Dead is probably the best series to come out of a film barring M.A.S.H. It is even better than another film is some ways because you have time to go into every nook and cranny of the story. But most of all, to see Bruce in the role of Ash again, well, that was worth the 22 year wait alone.